I. Fill out bridal questionnaire to set up an initial consultation. We will contact you within 24 hours. III. A sketch of your custom wedding dress is created for your review and approval. IV. Once sketch is approved, payment in full and your measurements are required. V. Upon receipt of payment, a mock-up is created from a muslin fabric. This step in the process gives a glimpse on what the shape and fit of your dress is going to look like and allows us to make any minor adjustments to the design. VI. After mock-up is approved, we begin to cut the pattern. Fabric selection and embellishments will need to be finalized at this time. Fabrication of your custom wedding dress begins. VII. 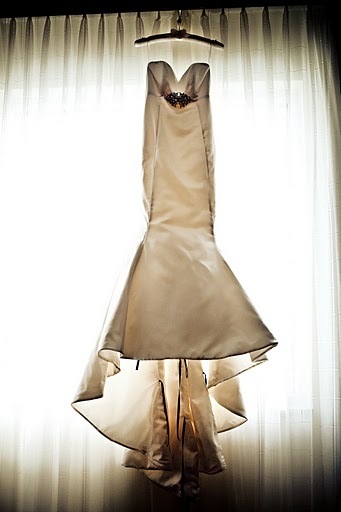 Your amazing, one of a kind, handcrafted wedding dress is created! We also offer custom veils, garter belts, bridesmaid, flower girl and mother of the bride/groom dresses as well as maternity.